When automakers send a car to journalists for a test drive, they typically provide one of the highest priced, loaded-up trim levels. Part of the reason is to show off the latest gadgets and gizmos, sure, but I think there’s a sneakier rationale at play. I call it option bribery. If you coddle writers in enough leather and car toys, they’re less likely to write mean things about you. That’s why the subject of this week’s review, the Honda Civic Hatchback, is a bit surprising. Instead of sending me a fancy-pants Sport Touring model with a thumping 540-watt stereo and lots of touchscreen doodads, Honda dropped off the kind of Civic people are much more likely to actually buy: the basic Sport trim priced around $22,000. And a model like this explains why the Civic remains a perennial hot seller. It’s not about the gizmos. It’s not about the luxuries. A new generation of the Honda Civic bows for 2017, including a hatchback with much more aggressive styling and a turbocharged engine. It’s about the raw appeal and practicality, two things this car has in abundance. On the emotional side, this new generation Civic steals your heart with a more striking body than before, particularly in the hatchback version with its dramatic side swoops, in-your-face grille and ultramodern back end. It looks like the kind of car you want to drive, not the kind your budget forces you to drive. The appeal spills over into the way it handles, too. The Civic has always been a spirited car, one that feels more firm and connected to the road than its arch nemesis from Japan, the Toyota Corolla. That continues with this generation. With a manual transmission, especially, the Civic is a blast to drive. While it sends power to the front wheels — not normally ideal for a sporty car — the steering, suspension and throttle all work in harmony to deliver an engaging, responsive sensation to the driver. All the hatchback models are equipped with a 1.5-liter turbocharged engine that adds to its spirited feel. It makes 174 horsepower in the LX, EX and EX-L models, while Sport and Sport Touring trims crank out 180 horses thanks to their spectacular sounding dual exhaust systems. There are a lot of little, logical things I like about it, too. It has ample storage for a compact car, with smartly placed bins and nooks for stashing your stuff. There’s a decent amount of cargo space in back, rivaling some small crossovers. And Honda always seems to get the small details right, like gauges that look crisp and sporty with red accents and good lighting at night. One downside: The manual transmission that I love so much in my $22,000 tester isn’t available on the high-end trims. If you want a fancier flavor with the best transmission, you’re out of luck, unfortunately. The new Civic’s cabin offers generous space for its class, including 25.7 cubic feet of cargo capacity behind the rear seat. Also, the same things I see as strengths — the firm ride, the aggressive exhaust note, the unusual styling — could be negatives depending on the kind of car you’re looking for. If you want to anonymously blend in and waft down the highway in buttery silence, this isn’t the best fit. From a technology standpoint, the Civic checks all the right boxes for a 2017 vehicle, including an available suite of driving enhancements called Honda Sensing to help avoid collisions and make trips more relaxing. I’m a big fan of the adaptive cruise control and lane keeping features that combine to make it feel almost like an autonomous vehicle when on a well-marked highway. I’m also glad Honda offers this package on the base LX model for a $1,000 premium, not only on the more luxury oriented trims. Pricing starts at $19,700 for the LX hatchback with a manual gearbox or $20,500 with a continuously variable transmission. It tops out at $28,300 for the Sport Touring trim before adding options. 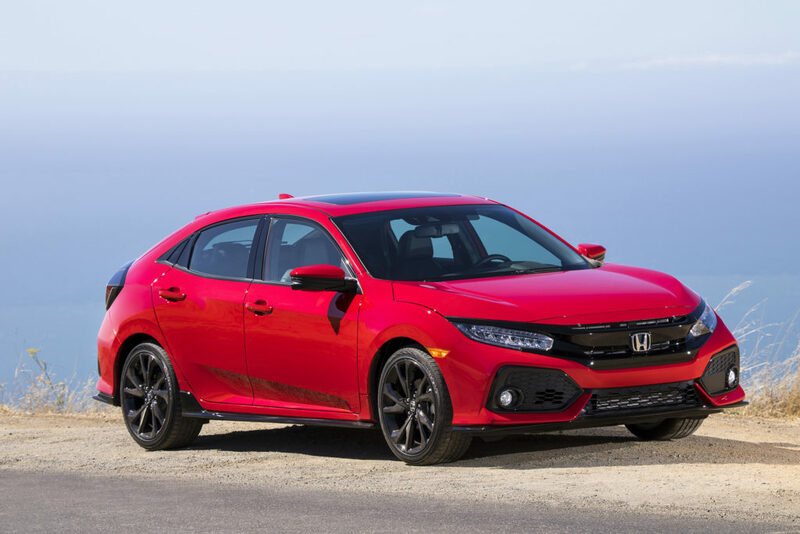 With an aggressive new look and a turbocharged engine under the hood, the Civic Hatchback is an engaging car to drive and look at.